We've created Children's Worship Bulletins based on familiar and not-so-familiar Bible passages — that's why you'll find children's church bulletins about Maundy Thursday in our extensive library. Over a three-year period, the significant verses and themes from the Revised Common Lectionary (including Lutheran variations), Lectionary for Mass, all four Gospels, the Old Testament and the Epistles are covered. You'll find children's church bulletins for every sermon, church event and holiday. 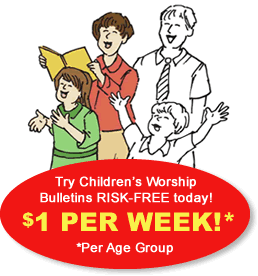 We've carefully designed Children's Worship Bulletins for two age groups — ages 3-6 and 7-12. The messages in each bulletin are clear, positive and universal to all Christian denominations. Bulletins include four panels of engaging puzzles, dot-to-dots, mazes, word searches and quizzes that are educational and fun. Young or older, your children will love them. Yes, you can use Children's Worship Bulletins as handouts during worship, but you can also use them to create an entire classroom lesson plan. Children's church bulletins about Maundy Thursday, for example, offer endless opportunities to teach children about serving others. In this article, we'll show you two ways to turn our children's church bulletins about Maundy Thursday into engaging classroom activities. Children's church bulletin about Maundy Thursday for ages 3-6: Jesus poured water in a bowl. Explain the activity, "Today, we'll learn how Jesus served his disciples at the Last Supper. While I read our Bible lesson, please complete the puzzle 'Jesus poured water in a bowl …'"
Read aloud John 13:1-17, 31-35 while the children work on their puzzles. Afterward, engage the children in a discussion about serving others as Jesus did by washing his disciples' feet. Explain, "We'll divide into two groups to serve one another a snack. While serving, you should give your full attention to your classmate. Wait quietly while your classmate finishes his or her snack, and then carefully collect the napkin and cup to throw it away. Clean up any crumbs that your classmate left." Divide the class into two groups. Have the first group come to the table for each to get a napkin, snack and beverage to serve to a classmate. If necessary, remind them to remain still and quiet while their classmates enjoy their snacks. Ask those who ate the snack how it felt to have someone serve them. Then, have the second group serve the snack. Afterwards, again ask those who ate how it felt to be served. Draw the class back to the conversation about Jesus washing his disciples' feet. Explain that Jesus wants us to serve one another as he did. Explain that the children can serve others simply by taking them a snack. Ask them to think of other ways that they can serve one another. Explain the activity, "Today, we'll learn how Jesus served his disciples at the Last Supper. While I read our Bible lesson, please complete the puzzle 'Jesus knew that the time had come for Him to leave the world and go to His Father ...'"
Read aloud or have the children read aloud John 13:1-17, 31-35 while the class works on its puzzles. Explain, "We'll divide into pairs to wash one another's feet. Give your full attention to the task of washing your partner's feet during this exercise. Wait quietly while your partner removes his or her socks and shoes, gently pour water over his or her feet and then use a clean towel to dry his or her feet. Again, wait quietly for him or her to put socks and shoes back on. Carefully fold the towel. After the first group finishes, we'll switch places — the group that washed feet will have their feet washed." If you wish not to use water for this activity packing peanuts or confetti can be substituted as an alternative. Divide the class into pairs. Have pairs come, one-by-one, to the front of the class to have their feet washed. Ask those who washed how it felt to wash someone else's feet. Ask those who were washed how it felt to have his or her feet washed. Then, have the pairs, one-by-one, return to the washing station to have the other partner's feet washed. Afterward, again ask how it felt to both serve and be served by this foot washing exercise. Draw the class back to the conversation about Jesus washing his disciples' feet. Explain that Jesus wants us to serve one another as he did. Explain that the children can serve others in ways other than washing feet — but that serving should feel the same way. Ask them to think of other ways that they can serve one another.